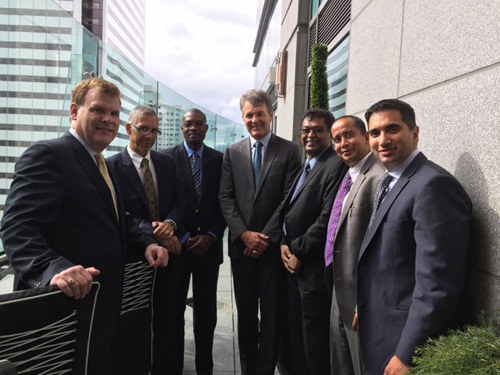 From left John Baird from Bennett Jones Law Firm, Minister Dominic Gaskin, Minister David Patterson, Abraham Drost President and CEO of Carlisle Goldfields, Vice President Khemraj Ramjattan, Andrew Ramcharran Executive Vice President of Petaquilla Minerals Ltd. and Abbas Khan of Bennett Jones Law Firm. A high level team of Government Ministers including Public Security Vice President Khemraj Ramjattan, Infrastructure Minister David Patterson and Business Minister Dominic Gaskin on Friday last met with Bay Street investors at Fasken Martineau, a major Toronto law firm where they discussed proposals and opportunities for a variety of projects mainly in mining, investment financing and alternative energy. The team is in Toronto to meet with both Canadian and diaspora investors interested in doing business with Guyana. The Ministers are accompanied by Kibbyann Chester-Harding and Shawn Doris from GO Invest, Kenneth Jordan from the Ministry of Infrastructure and Kiran Mattai from the Guyana Energy Board.